Now, lets create a JAVA DB Database to store our data. In the services tab, right click in the Java DB item under the Databases category and choose Create Database. 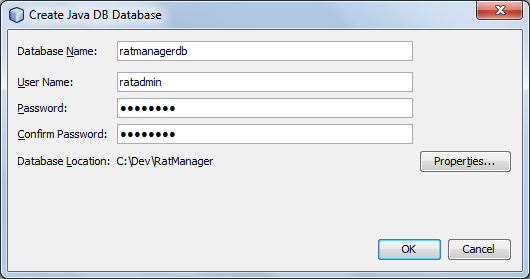 Write the name ratmanagerdb and user/password: ratadmin/ratadmin. Finally, choose a location to put the database, for example, the same project directory. Finally, we execute the query. Take a look at the tables to be sure that everything is alright. It is time of do the magic. Let’s return to the JavaFX project; we are going to get our entity classes out of the DB in just a few steps. Right click on the model package and choose the option New/Entity Classes from Database. 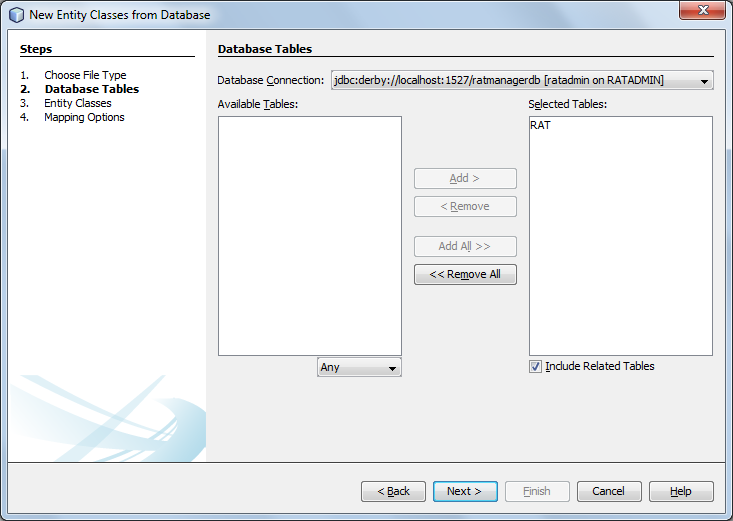 Choose the ratadmin connection and add the available tables to the project (i.e. the only one, the “rat” table). Click next, then finish and let the other options unchanged. Now, our model package is populated with all the entities corresponding to tables in our database (the so-called ORM). If we take a look to the class Rat, we see the usual JPA syntax with a set of NamedQueries on top and the attributes, setters, getters, etc. We can continue without worrying about such details (although, no serious java developer could go too far without knowing it…). It is a good time to add the JavaDB driver to our project, you can find it if you Right-Click in the Libraries directory of your project and choose Add Library. Maybe you have noted that Netbeans already added a couple of libraries and a Persistence.xml file that we would use later. Anyway, what about some programming? Until know everything have been about click-typing names; let’s focus on the core of our app. Right click on the “ui” package and choose the option New/Empty FXML (We could make our way without FXML, but that’s not the case this time). 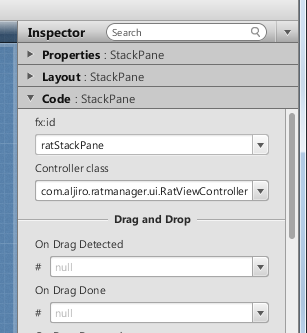 Name it RatView, click “next”, and check the Use Java Controller option, click “next” and check the Use CSS option; finally, click “finish”. We are now ready to specify the user interface. First, change the root pane of the scene by a StackPane (By default it is an AnchoPane). 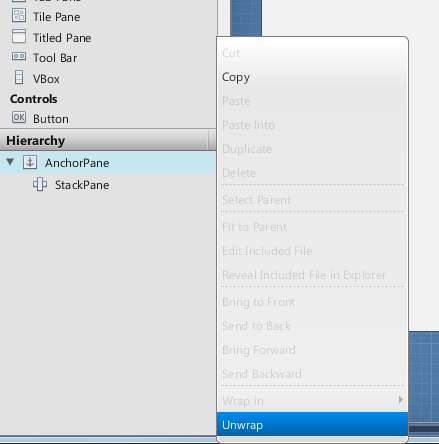 This can be accomplished in many ways, the easier one I find is to add a StackPane as a child of the AnchorPane put by default and right click in the last one selecting the option Unwrap. Now, we need to refer to the StackPane in the code, so we put an attribute in the RatViewController accounting for that element in the code (Don’t forget the import). Note the use of the @FXML annotation; it means, it is an element present in the fxml document, so we must put the same name there as it is in the code. To put a name to an element in the Scene Builder, find the code window in the right side accordion menu and paste the same name of the variable in the fx:id field (making sure the StackPane is selected). Well, let’s put some code in the controller. We need first an ObservableList attribute to put all the rats we are going to manage, and a variable where to hold every new rat we are adding. Also, after adding it to the container StackPane, we set up a FadeTransition using the FadeTransitionBuilder; this create a fancy entrance of the panel into scene. Note that we have put a style to the panel, so we can give it a cool look and feel just with the traditional css, great! don’t you think?. Finally, let’s add some code to save/delete/list our rats. The long awaited updateList() method runs a NamedQuery, which is defined in the entity class (you can look for yourself). This is done in two steps: create a query and execute the query; the results are added to the ObservableList that constitute the model of the TableView, any change to this list is reflected immediately in our TableView. On the other hand, the add button calls the method saveRat() (sadly some rats won’t be saved… specially in a neuro-lab), which use a transaction to persist the new object just created thanks to the binding of the Form displayed to the user; obviously, there is a couple of validations that need to be done before saving, but that’s up to you. We conclude giving birth to a method to delete entities which is invoked by the delete button (The code of the display button is left as a homework). Before we can run our application, we need to modify the RatManager class to update the scene we want to load, instead of the default one we erased at the beginning. Nice tutorial. It helpful for me. Unfortunately you forgot to post the method code for showRat(ratItem). So your tutorial example does not run. It would be so helpful if you could post it. And, second, can you post the libraries for persisting? I get constantly compilation errors. looks like some library problem. Thanks!